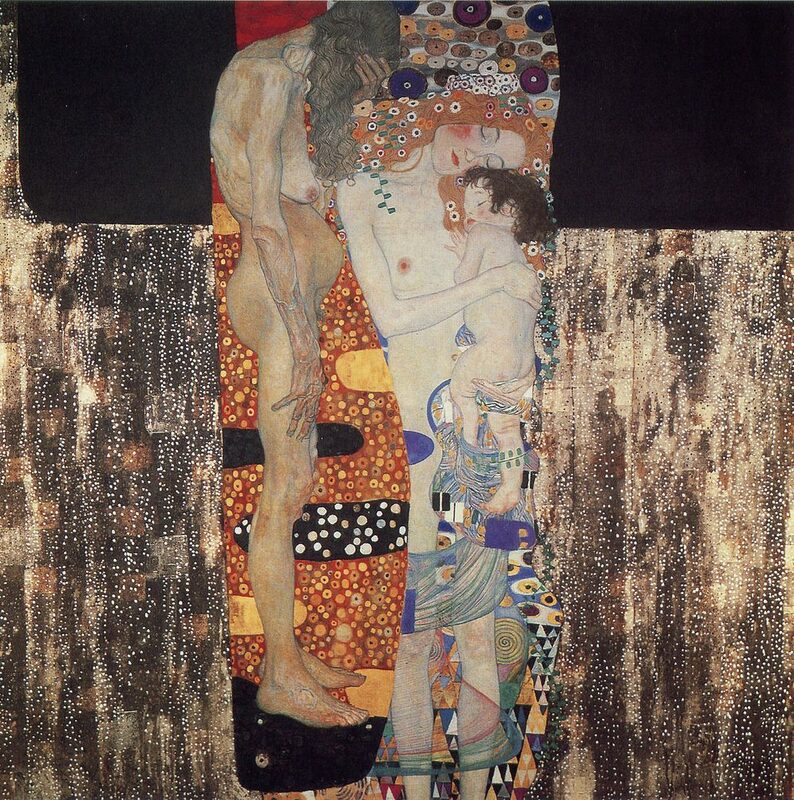 This Sunday is Mothering Sunday in the UK, so I thought it’d be a good opportunity to take a look at one of my favourite depictions of Womanhood; Gustav Klimt’s ‘The Three Ages of Woman’. Gustav Klimt was a past master of combining abstract design with intense human emotion. If the figures were removed from the composition, the work would be a sublime example of intricate pattern making and bold geometric shapes, and would stand as a masterpiece abstract work. The figures that float in front of these shapes transform the background into what are often referred to as ‘auras’, and serve to elevate the three females to a place of deep spirituality. The 3 females are very much ‘real’ women, not idealised nudes, but recognisable people, and this painting is a love letter to all three of them. To the right are the sleeping mother and infant. The circular patterned aura behind the mother’s head perfectly complements the tiny flowers decorating her long, red ‘Lizzy Siddell’ – like hair. She is totally immersed in serenity and unaware of our gaze. She clasps her innocent infant babe with such tenderness and intimacy; the babe rests her head against her soft flowing locks. As one’s eye moves down the 2 beautiful figures you notice the wispy, arguably emaciated legs of the mother – suddenly she seems not so real after all. The legs almost become part of the pattern behind, this effect is heightened by the violet patterns found on the diaphanous cloth she holds that partially wraps her baby. A little separate and disjointed is the elderly lady stood beside – we assume the mother of the mother. She looks away – she can’t bear to face us. Her body is tired and shows a life well lived. She’s often described as grotesque but I don’t see this in her – I see a beautiful vulnerability of someone who has lived and is hungry to live more, and is fearful of her own mortality. The pattern of the waves of her hair complement the other patterns in the composition. Her flesh has a realness that is stark and uncomfortable to look at. ‘The Three Ages of Woman’ is a highly inventive painting. The more I look at it the more I am convinced that we are looking at the same woman in the three ages of her life as opposed to 3 generations of a family, and that they are meeting in this beautiful, spiritual place (possibly heaven) and reflecting on how age and the stages of life can alter us. This heavenly place is decorated with the most beautiful patterns as well as the blackest black (a reminder of the possibility of finality or the unknown in the afterlife?). For me this painting, through its incredible abstract design, celebrates the beauty of the strength and vulnerability of womanhood. This is a visual poem about womanhood that whitewashes nothing, to create a masterpiece that is so unapologetically and powerfully real. 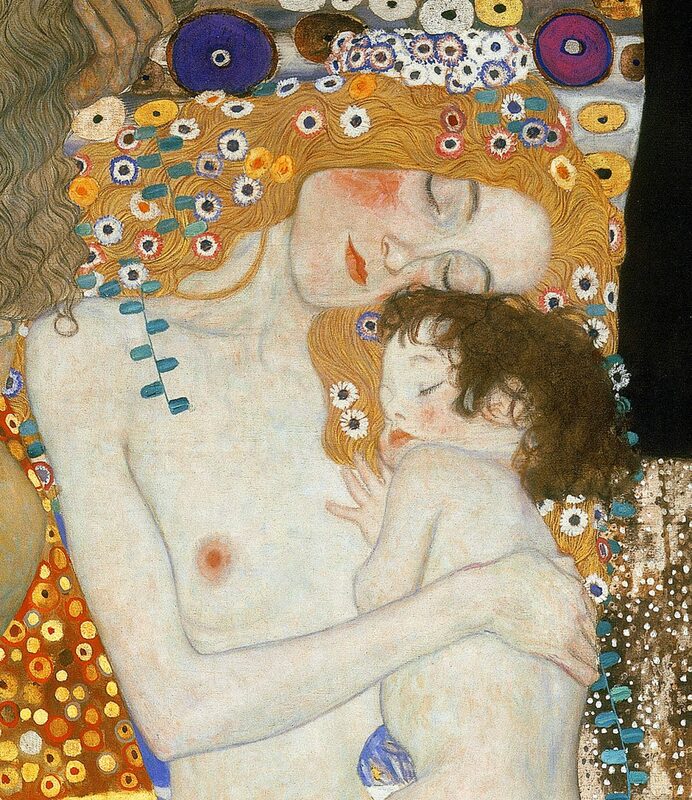 Header Image: ‘The Three Ages of Woman’ by Gustav Klimt, oil on canvas, 180cm x 180cm, 1905. The painting is housed at the Galleria Nazionale d’Arte Moderna, Rome.